"And he came down with them and stood on a stretch of level ground. A great crowd of his disciples and a large number of the people from all Judea and Jerusalem and the coastal region of Tyre and Sidon came to hear him and to be healed of their diseases; and even those who were tormented by unclean spirits were cured (Luke 6:17-18)." The feast of the Seven Founders of the Orders of Servites, which is ordinarily celebrated today, is superseded by the Sunday liturgy. The first reading is from the book of Jeremiah (Jer 17:5-8). Jeremiah lived through one of the most troubled periods of the ancient Near East as he witnessed the fall of Assyria and the rising of Babylon. In the midst of this turmoil, the kingdom of Judah, came to its downfall by resisting this overwhelming force of history. The two predominant themes of Jeremiah's message are to precisely define true Yahwehism, and to proclaim the imminent wars as punishments of Judah's aberrations. Today's reading falls into the category of true Yahwehism and is a wisdom saying on true justice. The second reading is from the first letter of Paul to the Corinthians (1 Cor 15:12, 16-20). This reading continues the teaching we heard last week on the resurrection of the dead. St. Paul addresses the Corinthian claim that there is no such thing as resurrection from the dead. The Gospel reading is taken from St. Luke (Lk 6:17, 20-26). Jesus then went out to a mountainside to pray, and spent the night praying to God. When morning came, He called His disciples to Him and chose twelve of them, whom He also designated apostles: Simon, his brother Andrew, James, John, Philip, Bartholomew, Matthew, Thomas, James son of Alphaeus, Simon the zealot, Judas son of James, and Judas Iscariot. 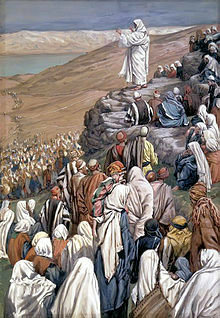 He then came down the mountain with them and delivered the sermon on the plain which is our reading for today. Read the more detailed, corresponding passage in Matthew 5:3-12 on the Beatitudes. Choose a beatitude to focus on for the rest of this month. Write it in conspicuous places throughout your house — desk, home altar, fridge, bathroom mirror. Think of some small practical ways to put this beatitude into action in your daily life. For some ideas on how to live the poverty and detachment prescribed by the first beatitude (Blessed are the poor in spirit), read this interview with spiritual director and writer Fr. Dubay. Read a summary of St. Bernard's advice for living the Beatitudes, and the Holy Father's exhortation to the youth at Toronto's World Youth Day to be people of the Beatitudes. "Why do you stand here all day idle? . . . Go you also into the vineyard" (Gospel). As athletes of Christ we are called to a competitive "race" (Epistle). As workers with Christ we are ordered into the "vineyard" (Gospel). It is a "race" with death for the "prize" of life eternal. Only "one receives the prize" by His own right, Christ! But, remember, He still runs in us if we do not lag in this "race," as did Israel under "Moses" (Epistle). God comes to us "early" in life. Unitl the last "hour" He repeats, "Why . . . stand . . . idle?" Each "hour" brings us nearer to the "evening" of reward, not due to the excellence of our work in itself but mercifully given by God as a recompense (Gospel).